How long do you think it took me to start baking cut out cookies from the day I bought a couple of sets of beautiful cookie cutter shapes? Two years. Is this normal, or is it just me, looking at them every time I open the drawer and thinking that one day, I will use them for something? But procrastination aside, there are some amazing recipes out there for perfect cut out cookies and this is one of them. They have the perfect sweetness, brightened with a little addition of salt and even though the edges keep shape, the cookies are still soft and delicious inside. You can ice them, put sprinkles on them and make them look really colourful but they are perfectly delicious without any icing. This cookie dough requires chilling for one hour or freezing for 30 minutes. If you want your cookies to keep shape, don’t skip this step. Take the butter and eggs out of the fridge and wait for them to become room temperature. In a bowl, using a mixer or some elbow grease beat the butter until it becomes creamy. Slowly add the eggs and sugar and keep mixing so that the mixture is smooth. Add the vanilla extract and almond aroma if using. With a spatula, mix in the flour, salt and baking powder. Roll the dough out on a piece of baking paper, cut the cookies out, take away the excess dough and roll more out on a new piece of baking paper. Continue until you have used up all of the dough. Stack the cookies on baking paper in layers, cover the last one with one more piece of baking paper and freeze for 30 minutes or chill in the fridge for an hour. You can chill the dough in the fridge for the night, if you need to or you can freeze the cookies, or just a dough ball for later use. Bake each sheet with cookies for 10 minutes. 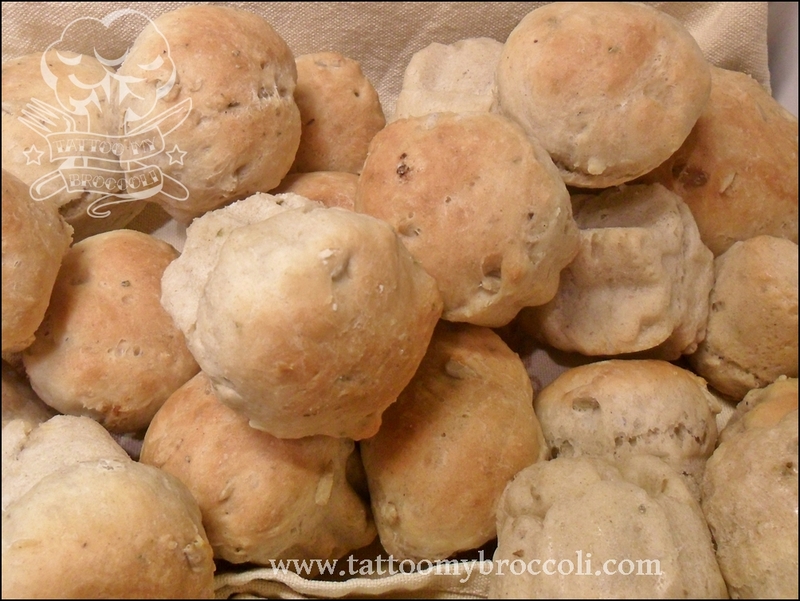 These delicious rolls can be made quickly while making soup or anything else for dinner and are really nice. I use silicone molds to shape them into quirky forms. Add all the ingredients to a bowl in the order above and knead the dough until smooth. Leave to rest under a plastic wrap for 20 minutes. Knead the dough again for a minute and either form into balls the size of a table tennis bowl or press into molds. Let rest another 5 minutes and bake for 20 minutes, until the rolls are golden on top. 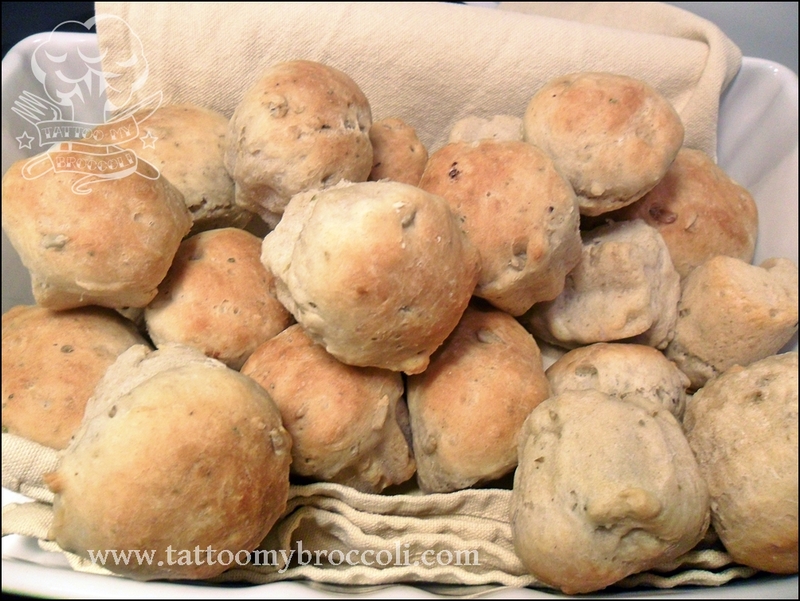 This is a chewy, soft and rather dense homemade bread that I make often. 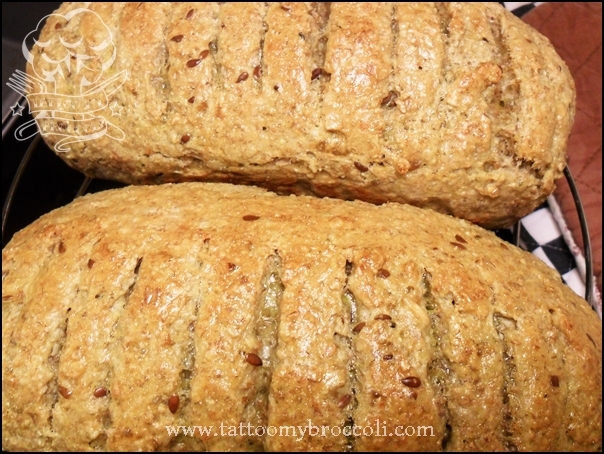 It’s packed full of pumpkin and sunflower seed goodness and has almost 70% wholemeal flour. It’s delicious with tomato, as a Spanish pan con tomate or homestyle with butter and a slice of ham. Also good with sweet toppings, like jam, for example kiwi fruit jam or persimon jam. Of course you can just put the ingredients in your bread machine and run the wholemeal program but if you don’t have a bread machine or want to make the bread by hand, here are the instructions. In a large bowl mix together the water, olive oil, honey and salt and stir until the salt dissolves. Add the flours and yeast and mix until everything is combined. 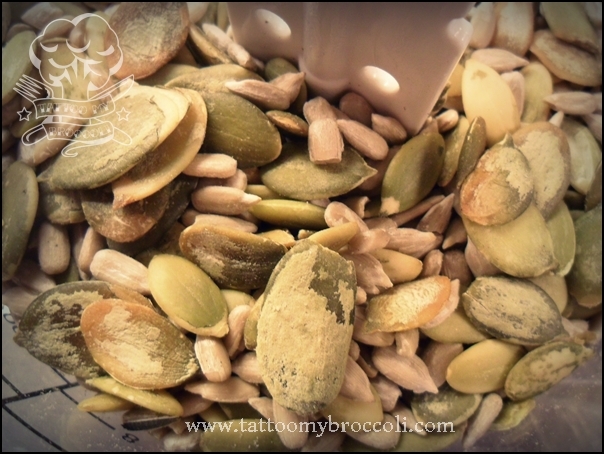 Place the three types of seed in a food processor and process as finely as possible. 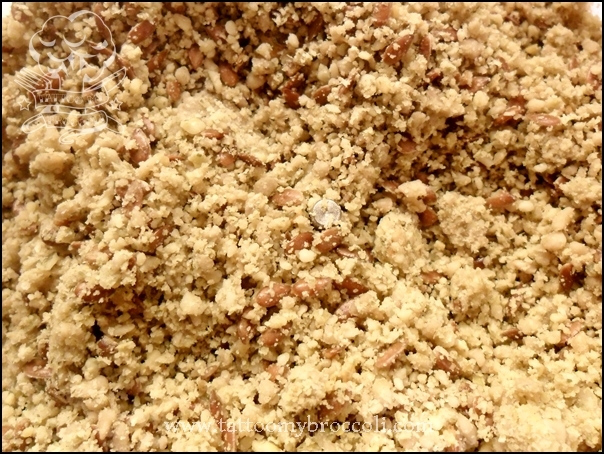 The pumpkin and sunflower seeds are easy to process to complete powder but linseed tends to stay unbroken. 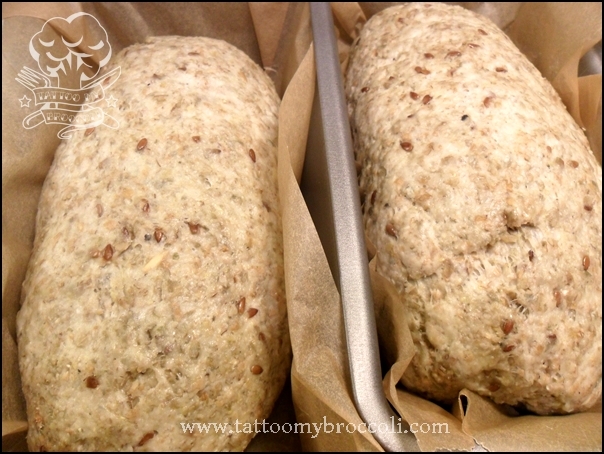 Add the seeds to the dough and knead until the dough feels smooth and pliable. Leave the dough covered with a cling film, in warm place, for 45 minutes. It should be double the size after this time. Turn dough out onto a floured surface and knead the dough firmly for several minutes. 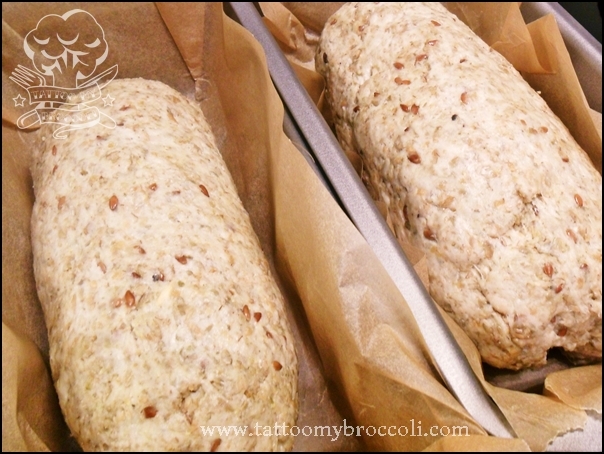 Shape the dough into two logs and place in two greased or lined loaf tins. Make cuts in the tops with a serrated knife. Brush with some egg if you’d like the bread to have a smooth finish. Cover with plastic wrap and leave dough to rise for about 45 minutes. Bake for 45 to 55 minutes. When ready, the bread should make a hollow sound when tapped.